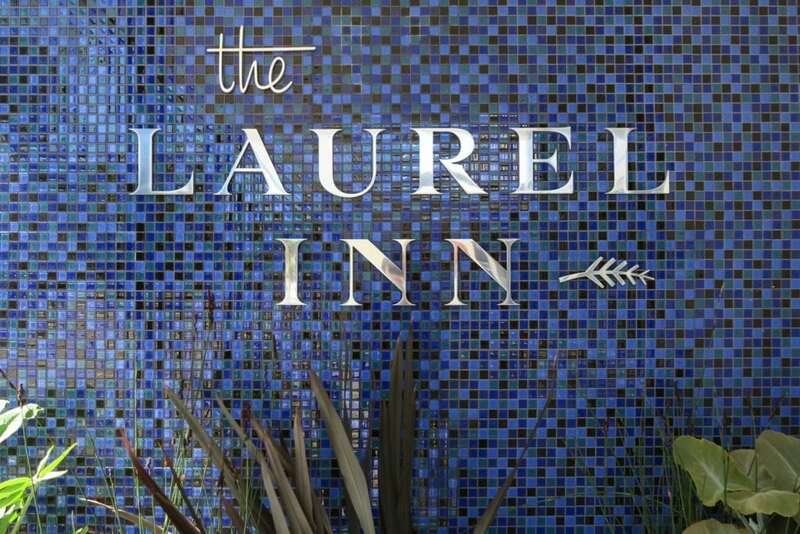 Welcome to The Laurel Inn, where that funky, spirited vibe that is 100% San Francisco meets a hint of cozy mid-century elegance. 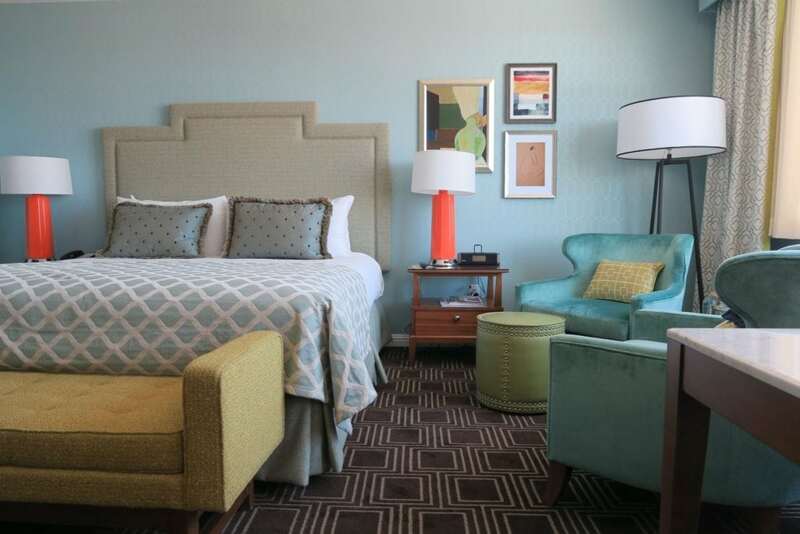 A typical City View King room at The Laurel Inn. Somehow, this Pacific Heights gem manages to pull off statement pieces like subtly shiny, subtly retro wallpaper and crushed-velvet armchairs in bright shades of turquoise. The decor at The Laurel Inn is clean, bright, and colorful, yet it maintains a style of understated sophistication that is uniquely its own. 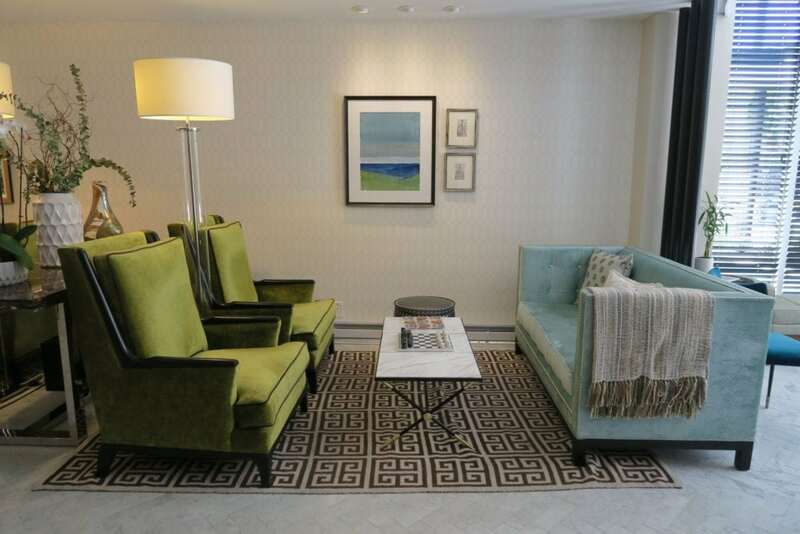 Fresh out of renovations, little Laurel Inn has claimed a place among the most desired accommodations in San Francisco. It’s centrally located yet a peaceful retreat from the grittiness of the city, and it seems that every detail has been considered in creating a space that’s both welcoming and fun. Welcome to The Laurel Inn! 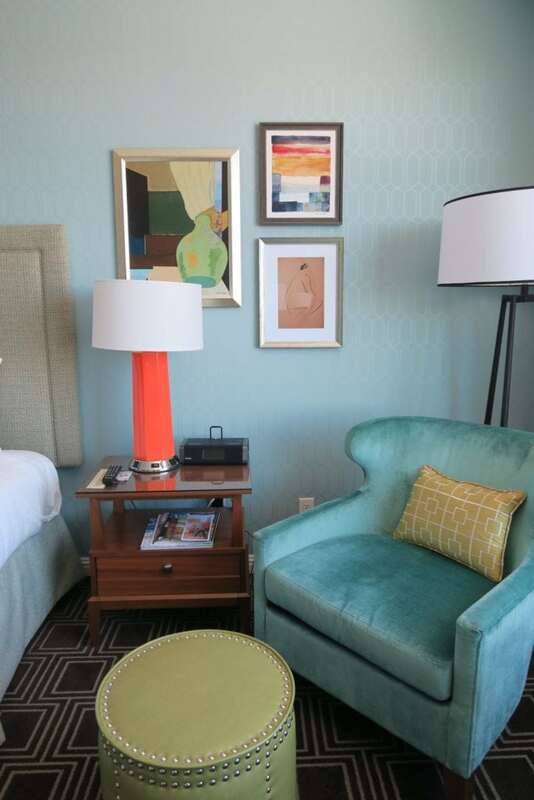 I loved this colorful little vignette in our room. With ultra-hospitable touches like lavender lemonade and just-baked cookies in the lobby every afternoon, it’s no wonder why The Laurel Inn hosts a good deal of repeat visitors. 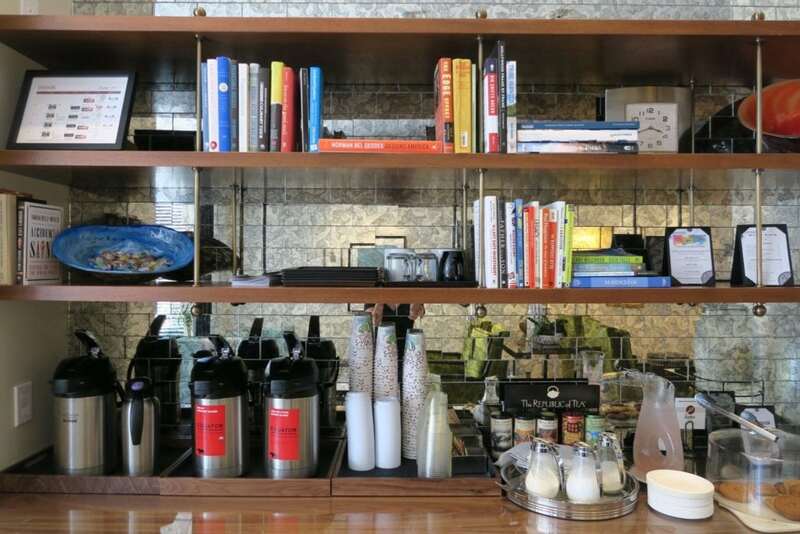 They’ve even partnered with Books Inc (a well-known independent bookseller just a few blocks away) to create a hotel book club, providing guests with a new bestselling read each month. That’s a quick way to make devoted patrons out of bookworms like me! Tea, coffee, and books available 24/7. What more do you need? 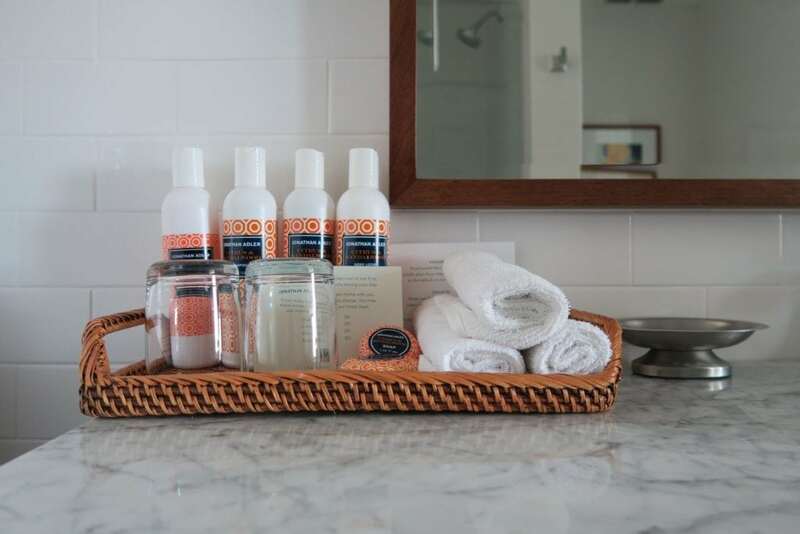 Of course, the comfy-classy feel of The Laurel Inn extends all the way down to the littlest details–like the full-size Jonathan Adler toiletries in all of the bathrooms. Let me just say that I thoroughly enjoyed the lingering post-shower scent of citrus and sandalwood as I lounged, pampered and blissful, in one of the fluffiest hotel bathrobes I’ve encountered yet. Look how comfy that bed is! Can you blame me for taking a night off from San Francisco’s chilly streets? 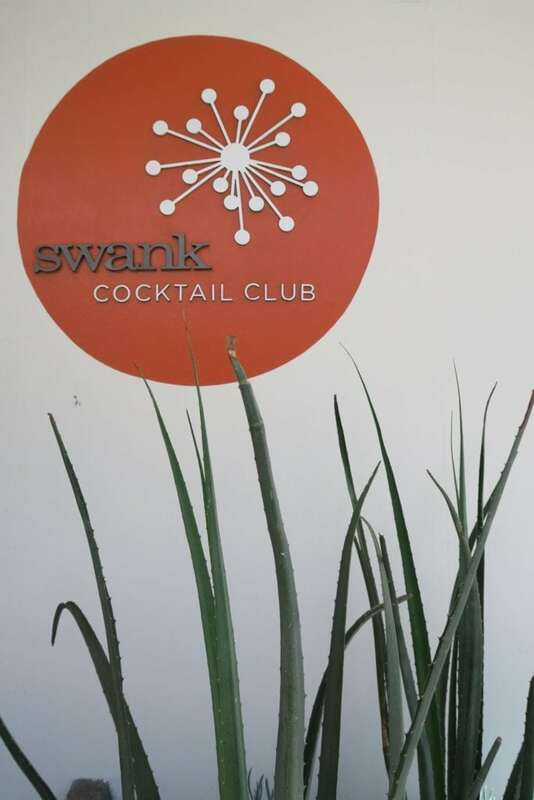 If letting off steam in attire that’s a bit more presentable than a bathrobe is more your speed, plan for happy hour at the on-site Swank Cocktail Bar & Lounge. In keeping with San Francisco’s city-wide commemoration of the Summer of Love, Swank had a special menu of craft cocktails on offer during my stay with names like Hippy Hill and Jerry Garcia’s Electric Kool-Ade. In line with San Francisco’s penchant for inclusivity, even your fuzzy friends are welcome here! 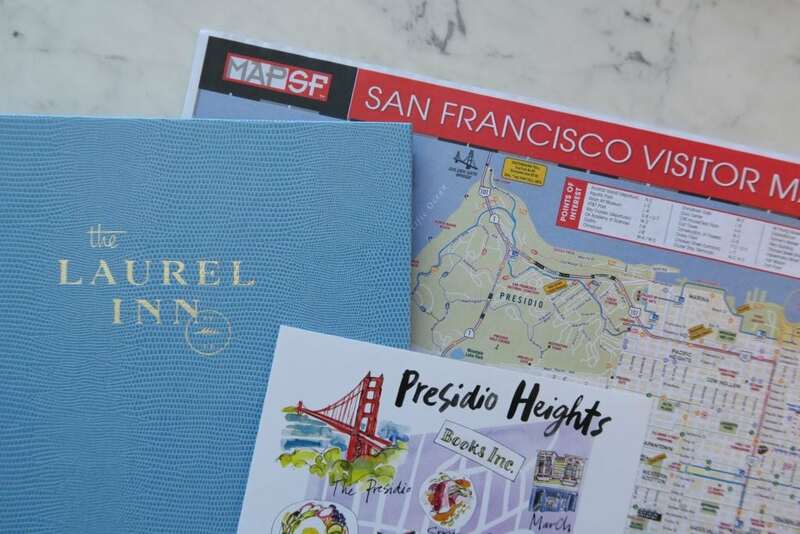 The Laurel Inn offers special pet-pampering packages in collaboration with a pet store located next door, and the Presidio streets surrounding The Laurel Inn are hilly but inviting–perfect for meandering strolls with your four-legged sidekick. It’s all in the details at The Laurel Inn. And, lastly, I would be remiss if I didn’t mention the killer city views from many of The Laurel Inn’s rooms. 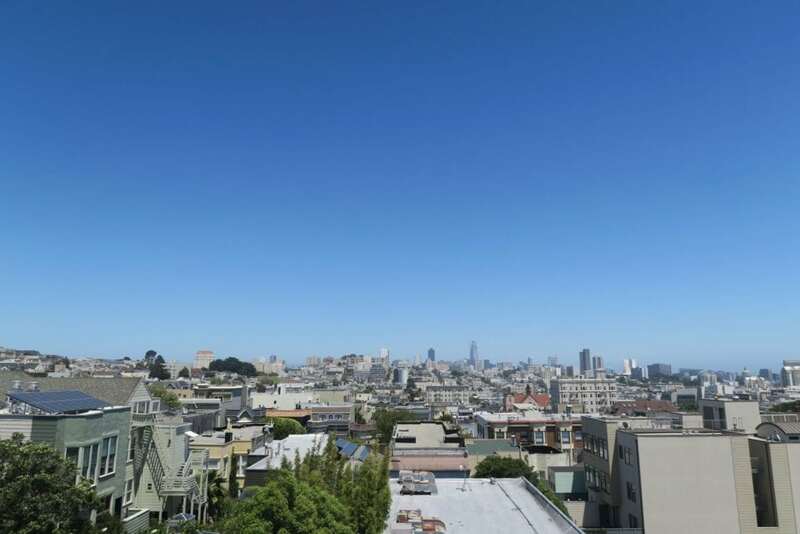 If you’re at all familiar with San Francisco, you know that the city’s universal appeal means that there’s a lot of people vying for the little bit of space available on this 7-mile-by-7-mile peninsula. Sprawling windows looking out over the rooftops of San Francisco are uncommon at best, but there’s a concentration of them at The Laurel Inn–and on days when Karl the Fog is away on vacation, you can see all the way to a little blue strip of the San Francisco Bay. San Francisco on a rare fog-less day. 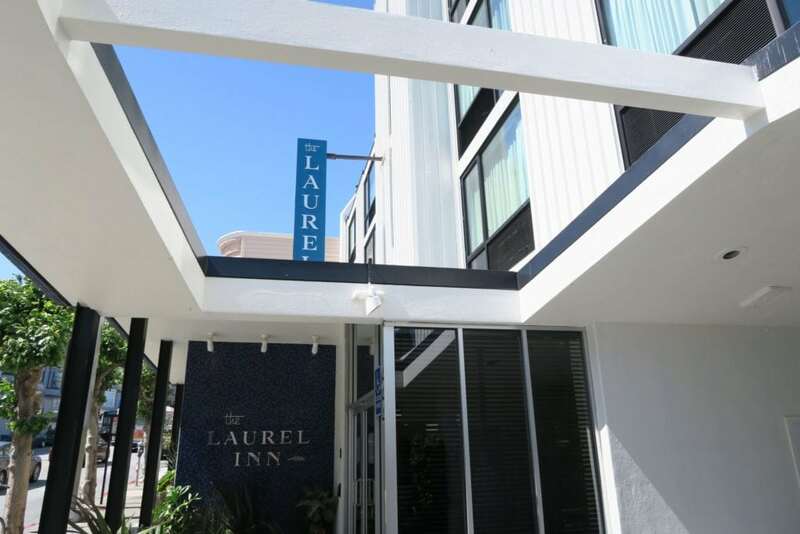 The Laurel Inn promises a pleasant stay in the heart of San Francisco, providing travelers the comforts of home with a distinctly Californian flair. 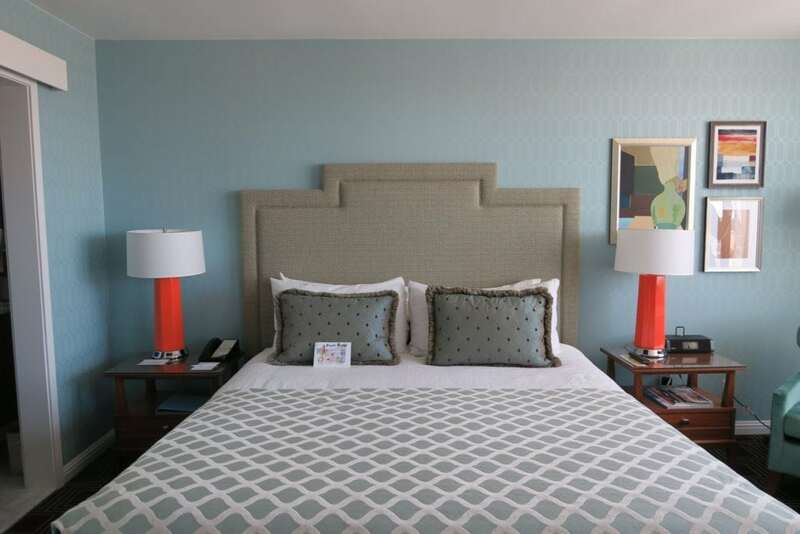 If you appreciate a well designed hotel with a love for the little things–or if you’re just in it for the chocolate chip cookies and dog-friendly rooms–The Laurel Inn is the place for you.